David Beckham’s saga of bringing MLS to Miami may finally be coming to a close, potentially raising San Antonio FC’s chances of bringing MLS to San Antonio. Lago’s report confirms MLS owners are evaluating the Miami situation. Reading between the lines of things MLS officials wont say, the owners and league office wont let a complicated situation in Miami compromise the truckloads of cash being distributed throughout the league when the four new expansion franchises are awarded. While the twelve expansion-hopefuls will be expected to pay $150 million solely in expansion fees, Beckham’s expansion franchise comes at a deep discount as part of his player contract. 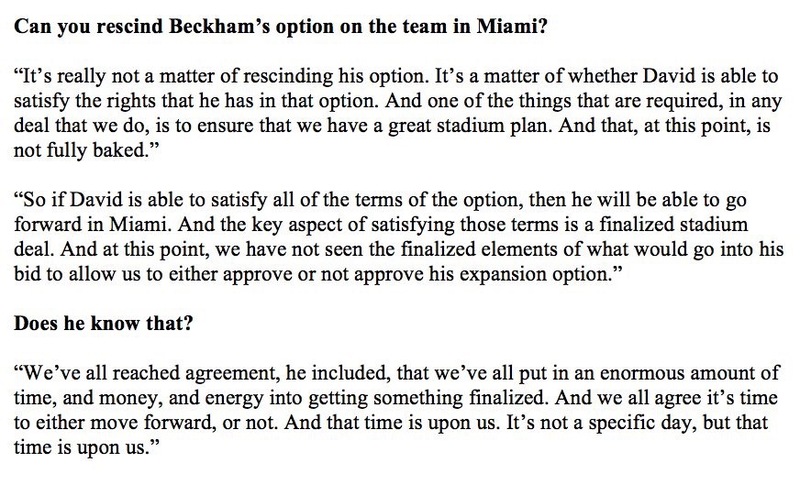 With Beckham’s star fading each year further removed from his magnificent playing days, MLS cant allow Miami to slow the process of bringing in the next four cities. The next MLS expansion club to take the field will be 2018 entry LAFC. Assuming Miami doesn’t figure out their stadium situation, the league will not have any new clubs in 2019. Two of the twelve expansion hopefuls will begin play in 2020 with the final two expected at a later date. If Miami falls, MLS could be looking to a city ready to take the field in 2019 or potentially even 2018. Sacramento has been proclaimed turnkey ready in the past, but other cities could deploy temporary solutions while MLS stadiums are being built. Cincinnati’s current stadium, a college football stadium, has the seating capacity for an MLS squad for example. The Alamodome is San Antonio’s biggest asset should a blitz for Miami’s slot 24 occur. While not an ideal situation, San Antonio FC taking the pitch in the Alamodome for a 2018 or 2019 MLS season would allow the time needed for expansion at Toyota Field or another soccer specific stadium. While the twelve new markets continue to battle for slots 25-28, Beckham and his partners will likely continue to battle to bring expansion slot 24 to Miami. But after spending several years and significant money with nothing to show, Don Garber could sound his whistle and end Miami’s expansion game soon.